Last night With God’s Grace held our monthly mobile in East Dayton. 135 families came out in the cold weather to received food for their families. 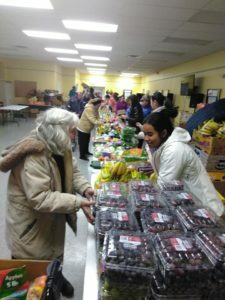 They were able to get 11 non-perishable food items, 5 Dairy, and cooler items, bakery and bread and 6 packages of fresh produce and unlimited on loose produce. With God’s Grace would like to thank our 12 volunteers that came out to help make this mobile event possible. Thank you for your dedication to help fight hunger. With God’s Grace need more volunteers at this location monthly. Please come out and join us next month. Previous Previous post: Day before Thanksgiving in Xenia Ohio.